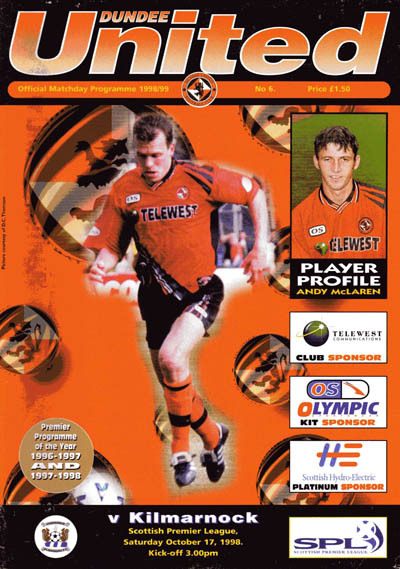 Alex had been with Celtic as a youth player, Morton, Port Vale (loan), Newcastle United and Ipswich before his move to Dundee United. He failed to perform as expected at Tannadice and went out on loan Preston North End on loan in September 1999 for three months. 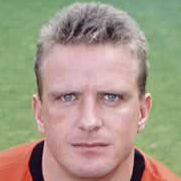 After returning to Tannadice, he still could not command a first team place and in September 2000 he was released and joined York City. Alex was born on this date in Bathgate. The less said about this game the better. Killie were always in control and deservedly won. An apparent lifeline was thrown to us with the 58th minute award of a penalty when Vareille was adjudged to have impeded Jim Paterson. For once the normally reliable Billy Dodds failed to beat Marshall from the spot and with that went any chances of taking something from the game in which Alex Mathie started and Jason de Vos came on as a substitute for both to make their debuts. Vareille's late goal was no less than the visitors deserved. Alex Mathie opened his account for United with the winning goal as United deservedly collected all three points at Tynecastle. Jason de Vos made his first start for the club, while Magnus Skoldmark also bravely played despite still recovering from a depressed fracture of the cheek-bone and both men helped the United defence keep a clean sheet to compliment the win.